because maybe in February I can pick up a magazine without hearing about how every single celebrity, I use the term celebrity loosely, is dieting for 2010. Is it too much to ask that I pick up US Weekly and read about where Angelina Jolie and Brad Pitt took their eighteen kids to eat out? Maybe Britney Spears had a date? Or George Clooney is on a secluded island by himself, oh along with a pesky paparazzi of course, otherwise we would have no picture. Right now Suri Cruise could be raising a havoc in nursery school and I would know none of it for all that is being crammed down my throat right now is diet nonsense! Show me an Olympic athlete telling me how to get fit and eat right and I will lend an ear. Show me Kim Kardashian, Beyonce, Carrie Underwood, Jennifer Lopez, the list goes on and I will close my ears and eyes! If I had my own meals delivered, my own chef, my own fitness trainer to follow me around the world and my very own plastic surgeon when none of that helped, I would be perfect as well! Until then I shall eat a cupcake and look forward to next month. 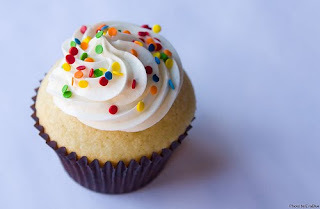 I think any diet that deprives you of a cupcake is just pure evil. And unfortunately those stories seem to pop up year-round.